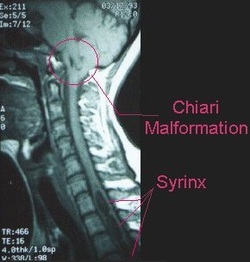 Syringomyelia is a common disorder which is mostly affecting the spinal cord. Syringomyelia will lead to formation of the fluid filled cavity which will extend from the central canal in the cervical region. The main aim of treatment is the drainage of the fluid filled cavitiy which is done surgically. Patient who suffer from syringomyelia may complain of loss of temperature sensation as well as sensation of pain of the upper extremities. The complication of syringomyelia may include destruction of the adjacent gray and white matter that cross the spinothalamic tract. At the end it may result in reactive gliosis. Syringomyelia may progress and affecting other sensory tracts and motor tracts. There are a few causes of syringomyelia which include trauma, Arnold Chiari malformation as well as intraspinal neoplasms. Syringomyelia may not affecting the touch and proprioception sensation. 1.Ball, MelvynJ., and AnthonyD. Dayan. “PATHOGENESIS OF SYRINGOMYELIA.” The Lancet 300, no. 7781 (October 14, 1972): 799–801. doi:10.1016/S0140-6736(72)92152-6. 2.Williams, B. “On the Pathogenesis of Syringomyelia: A Review.” Journal of the Royal Society of Medicine 73, no. 11 (November 1980): 798–806.